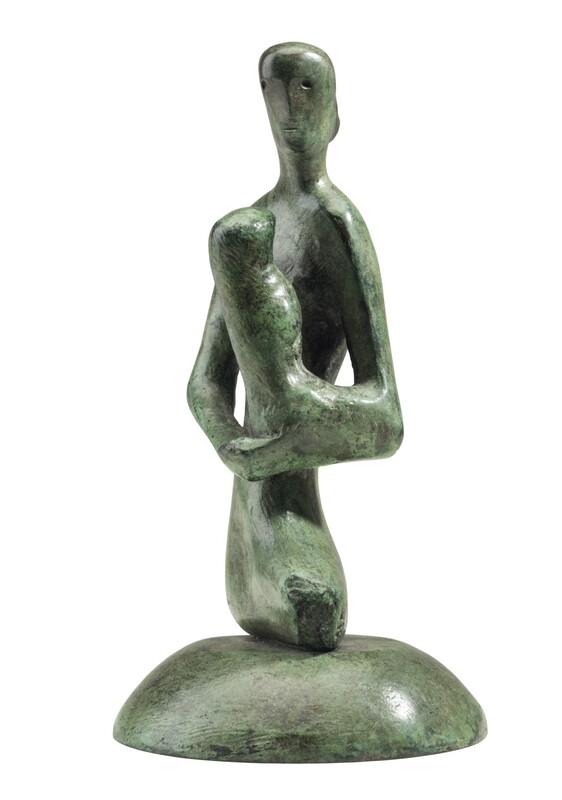 The ‘Mother and Child’ was one of the most important reoccurring themes of Henry Moore’s career, which he described as “one of my two or three obsessions, one of my inexhaustible subjects…(it) is eternal and unending.” The relationship between parent and child took on potent new meaning for Moore during the Second World War when he was commissioned to draw the figures sheltering in the London Underground. Observing these tender moments of the Blitz, Moore turned to the mother and child as a defiant symbol of love, protection and essential humanity as well as an interpretation of the traditional Madonna and Christ. For Moore the portrayal of this relationship was also deeply personal and related to his own struggle to have a child with his wife Irina. ‘Mother and Child: Gothic’ is a poetic reimagining of this central theme in Moore’s oeuvre that emphasises the lyrical tenderness and affection between mother and infant. In the present sculpture Moore evokes the intimacy of this pivotal human relationship through the protective position of the female figure as she cradles her vulnerable child in sensuous curves of bronze. The intense emotional resonance of this sculpture reveals Moore’s technical mastery and ability to imbue his sculptures with levels of different symbolic meaning. The ‘Gothic’ title of this work also refers to Moore’s fascination with Early Gothic sculpture, which he prized above the Greco-Roman tradition revered in the Western History of Art. Moore particularly valued the spiritual vitality of Gothic art, which he aspired to recreate through his own sculptural process. By the time Moore conceived and cast the present version of the ‘Mother and Child’ in 1975, he was celebrated as the greatest living sculptor of his generation. Throughout the 1970s Moore had begun to carefully consider his own legacy; establishing the Henry Moore Centre at the Art Gallery of Ontario (1974) and the Henry Moore Foundation at Perry Green (1977), and donating a considerable number of sculptures and graphics to Tate (1978). In addition, the British Council staged the largest exhibition of Moore’s work to date at the Forte di Belvedere in Florence in 1972, opened by Princess Margaret. ‘Mother and Child: Gothic’ was acquired directly from the Edna and Stanley Tuttleman estate sale. During their marriage the Tuttlemans amassed an outstanding collection of Impressionist, Modern and Contemporary works of art including Moore, Lichtenstein, Botero and Calder. The Tuttlemans were renowned for their philanthropic efforts in Philadelphia with key donations of major artworks to institutions including Philadelphia Museum of Art, Philadelphia University and Pennsylvania Academy of the Fine Arts.